7 Kids and Us: Join The Clear Skin Revolution And Challenge Yourself To An AcneFree Life! Join The Clear Skin Revolution And Challenge Yourself To An AcneFree Life! My boys are not so little anymore. With that comes a whole different amount of issues. Goodbye potty training, tantrums, whining...hello acne, girls and independence. While I am not ready for most of these things, I love that I can have a product on hand all the time, to at least help with the acne, which helps with the girls, which helps with the independence. AcneFree is the only brand that makes acne clearing systems formulated with Advanced Micro-Benzoyl Peroxide: a key ingredient designed to work faster and penetrate deeper into pores. AcneFree 24 Hour Acne Clearing System is clinically proven to be as effective as Proactiv™ 3-step System*, and includes Oil-free Purifying Cleanser, Renewing Toner and Repair Lotion. Just 3 simple steps 2x a day for clearer skin, with visible results in just 1 - 3 days! I gave him the AcneFree recently, and showed him how to use it, and now he is using it by himself, and I can see his confidence growing. It's great that the product is so easy to use, and it works so fast! AcneFree is also available in Severe and Sensitive. Plus, check out the #AcneFreeLife Sweepstakes for a chance to win $1,000 and AcneFree® products. 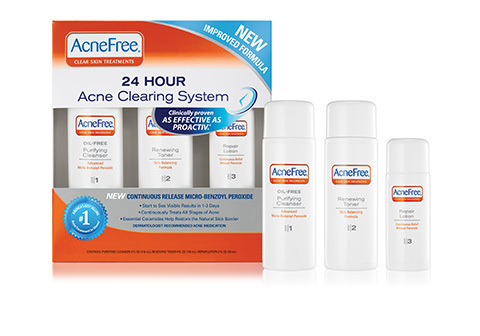 Enter the #AcneFreeLife Sweepstakes today and experience the AcneFree difference for yourself. For more information visit us at AcneFree.com and join the conversation on social media @AcneFree.